Directions: Persons applying for a first-time New Mexico driver license, or those with licenses expired for one year or more, must pass the knowledge written test. This test is not required if you have a current out-of-state driver license. Persons with a current out-of-country license are required to take the written test. State offices typically do not allow the written test to be taken after 3pm to ensure the applicant has sufficient time to complete the test. The knowledge test consists of 25 multiple choice questions that are important to the safe operation of a motor vehicle and New Mexico laws and driving practices. The questions are based on the information provided in the manual. A passing score consist of at least 18 correct answers. 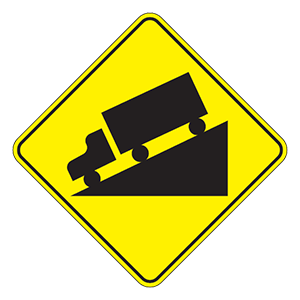 This sign warns that a steep downgrade is ahead on the road. Drivers should check their brakes. When driving on a public highway, the maximum speed limit is 55 miles per hour. If a different speed limit is posted, follow the posted speed limit. Allow for extra space when driving behind a motorcycle. Motorcycles can stop more quickly than other vehicles can and you must have adequate room to stop if the motorcyclist brakes or falls off. Also, remember that motorcycles are difficult to see at night because they only have one tail light. They are more difficult to see than cars. They rarely use their headlights. Motorcyclists are less skilled drivers than other motorists. Motorcycles are smaller and harder to see than cars. Because of their size, they are easily hidden in a car’s blind spot. It may be difficult to judge your distance to a motorcycle and difficult to tell how fast a motorcycle is moving, so always be alert and extra cautious when near a motorcyclist. Wearing both your lap belt and shoulder belt increases your protection in an accident. If your vehicle has a two-part safety belt system, be sure to wear both the lap belt and the shoulder belt. Wearing either part alone reduces your protection. The maximum or minimum legal speed you can travel on a road under dangerous conditions. The maximum or minimum legal speed you can travel on a road under ideal conditions. The suggested speed to travel on a road under ideal conditions. A speed limit is the maximum or minimum legal speed you can travel on a road under ideal conditions. You may drive more slowly than the posted speed, but it is illegal to drive any faster. You must drive more slowly where signs or signs indicate a school zone or work zone speed limit. If conditions such as road construction or bad weather make the posted speed unsafe, drive under the speed limit. Which lane must you be in before making a left turn from a one-way street? When making any turn, turn from the lane closest to the direction you wish to travel into the first available legal lane. If you are making a left turn from a one-way street, this means that you would make the turn from the lane nearest to the left curb. A steep grade is ahead. You must turn left ahead. 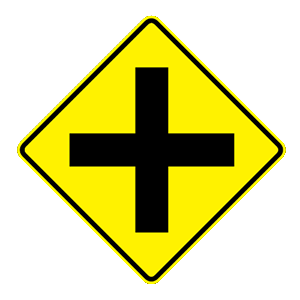 This signs warns that a four-way intersection is ahead.